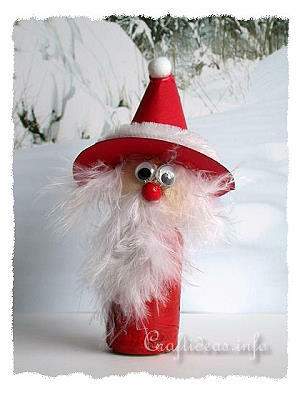 Who can believe that this Santa is made out of a recycled wine cork? 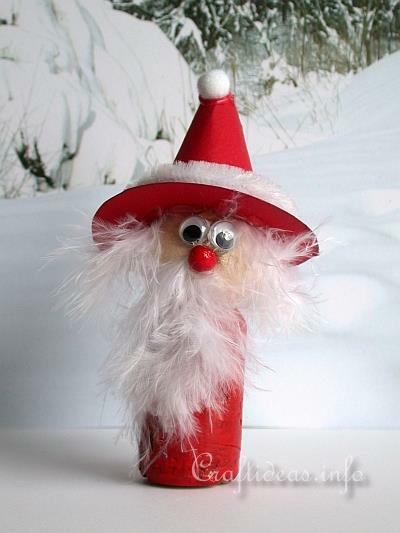 Kids will have fun making this cute Christmas craft for the holidays. 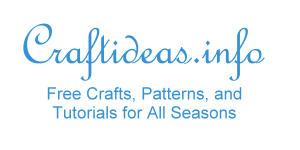 It is a really easy project and is finished with a couple of hours. 1. Paint the cork red and set aside to dry. 3. 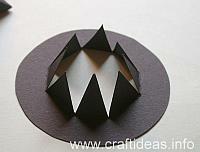 Create a Santa hat by following the instructions below in the step-by-step pictures. Wrap white chenille around the brim of the hat when it is dry and a small white pom pom on hte top of the hat. 7. Dry brush the cheeks with pink paint. This is done by dipping a stiff brush in the paint and wiping the paint off onto a paper towel until almost no more paint comes off the brush. Then pounce the brush onto the cheeks. Continue until the intensity you want is achieved. 8. Glue the head onto the body body. 9. Glue one white feather onto the side of the face so that the soft part of the feather is facing down. Cut away excess feather at the top of the head. 10. Now do the same with the second feather. 11. Glue on a feather as a beard. 1. 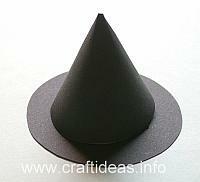 The Santa hat requires a cone shape and a circle. 3. 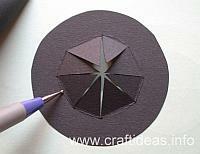 ...and then bend the “pie” pieces upwards. 5. This is how the finished hat looks and is ready to use for the fairy, Santa or witch.